Orange Cake With Chocolate Chips. It’s January (frankly, a pretty crummy month) and we face a choice, should we start making resolutions or help people break them? Since most resolutions seem to involve people enjoying less food, drink and fun we favor “breaking” resolutions. (Unless you resolve to do more good things for yourself and others, in that case- carry on!) But if you are trying to rid yourself of an otherwise harmless and / or pleasurable indulgence and feel a bit of weakness, or lack of shame, or just admit that you want to live life without regret…well come on over, have a snack, grab a cocktail and enjoy some cake. We will be waiting here at the farm with open arms and a warm kitchen, always. And if you happen to amble by the farm in January, then you might be lucky and get some orange cake with dark chocolate chips. And thank heaven for citrus this time of year (and good chocolate any time of year). Just when you slog through that last bite of heavy (albeit lovely) holiday food, the oranges and lemons arrive to bring a burst of bright flavor back to winter. The Meyer lemons, cara-cara and blood oranges seem to save the light and bring it back to our houses, right when we need it the most (yeah, yeah, we are in California it isn’t that cold, but whatever ;-). The winter citrus gives us sorbet, cocktails, savory sauces, confections and this cake that combines fresh oranges and dark chocolate. Hard to go wrong. And very hard to go wrong if you use the best dark chocolate you can find. As a special Christmas gift, the boys and I gave Carolyn a big bag of Mast Brothers dark chocolate chips. The Mast Brothers hail from Brooklyn and have some of the best chocolate we have ever tasted. We are all for local chocolatiers, and many do excellent work- but great is great, and we can’t do better than Mast Brothers chocolate. Simply awesome, and worth a mention all the way out here on the left coast. We usually reserve our best chocolate for eating out of hand, but this cake combines chocolate chunks and a chocolate ganache glaze with sweet, bright orange flavor and a light “cake-y” texture. It is a perfectly balanced bite, and the better the chocolate, the better the cake. As for the recipe, we adapted it from Ina Garten (the Barefoot Contessa), who adapted it from the famous Hampton’s bakery and caterer Loaves and Fishes. Good recipes tend to travel well and this is no exception. There are no special ingredients or techniques in this recipe, it just asks for a bit of extra effort and good chocolate. The recipe for the cake is mostly standard, as is the recipe for the chocolate ganache you use to “glaze” the cake. The only extra step is to create an orange syrup and brush it into the cake. But this step does make a difference. Every bite explodes with the sweet oranges and a blast of deep, dark chocolate, but the acid of the oranges and slight bitter edge of chocolate balances the flavor. Good from beginning to end. So when you decide to give up on that resolution about cake, or sugar, or chocolate, or fun…try this recipe out. If you’re gonna break the resolution, it may as well be worth it. Or, even better, just bake the cake and share. No resolutions required (ever). It may seem fussy, but when you zest oranges (or any citrus) take your time and avoid any of the bitter white pith. Bitter flavors are welcome in many recipes, but not cake. The less white pith, the better. 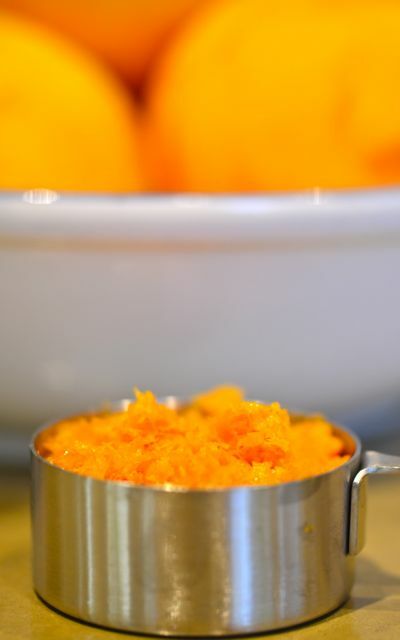 You will zest more oranges in this recipe than you need for juicing. To store zested oranges, wrap them tightly in plastic wrap and place in the fridge. They will keep for at least a week. What You Get: A full blast of orange and dark chocolate. A good reason to break any sugar or chocolate related New Years resolutions. 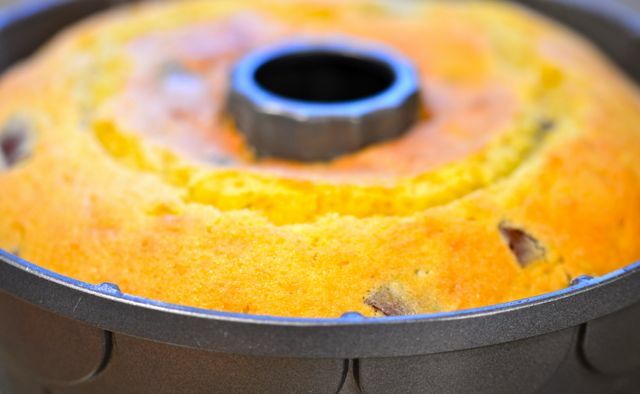 What You Need: A Bundt or ring pan for the cake. A stand mixer is a big help. How Long? About 90 minutes with 20-30 minutes of active time. A weekend dish. Place a rack in the middle of the oven. Preheat oven to 350 degrees. Grease and flour a 10-inch Bundt pan or cake ring. Fit your stand mixer with the paddle attachment. Add the sugar and butter and cream at medium speed for about 5 minutes, or until light and fluffy. Add the eggs one at a time, blending in at medium speed, and then blend in the orange zest. In a large bowl sift together the flour, baking powder, baking soda and salt. In a medium bowl, combine the orange juice, buttermilk and vanilla. In a medium bowl, toss the 2 cups of chocolate chips with the 2 tablespoons of flour. 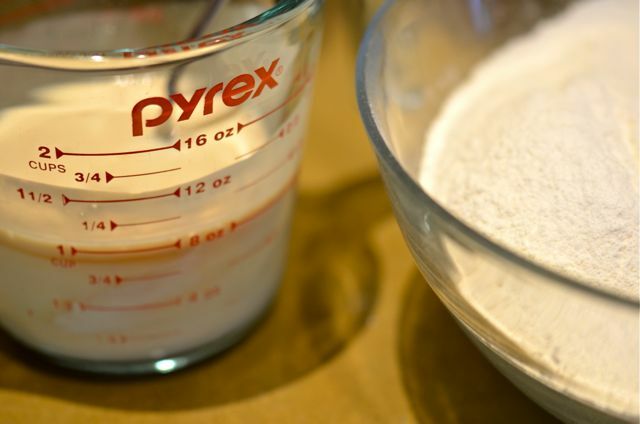 Add the flour and buttermilk mixtures to the creamed butter, in thirds, alternating at each step and mixing until combined. Add the chocolate chips to the batter and mix lightly, until combined. 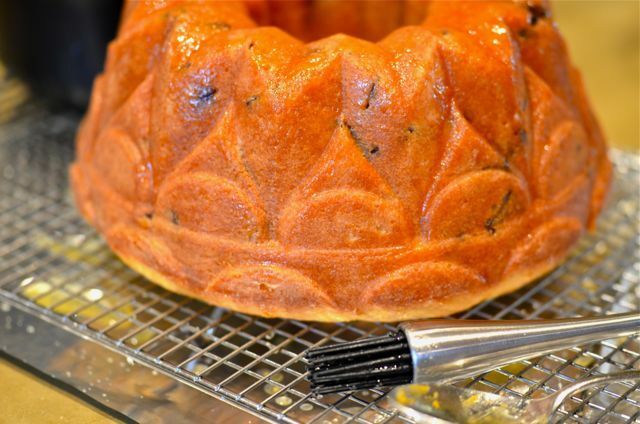 Pour the batter into the Bundt pan and bake for 45 – 60 minutes or until a cake tester comes out clean. Let the cake cool in the pan on a wire rack for 10 minutes. Meanwhile, to make the syrup place a small saucepan over medium heat. 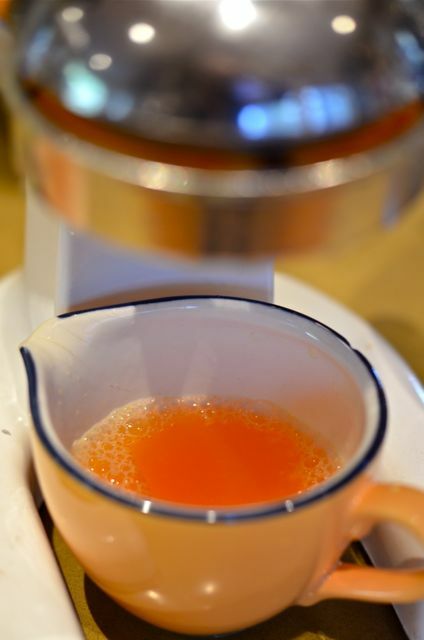 Add the sugar and orange juice and cook until the sugar dissolves. Remove the cake from the pan and set it on a rack over a tray (the syrup may drip). Spoon or brush the syrup over the cake. Allow the cake to cool completely. 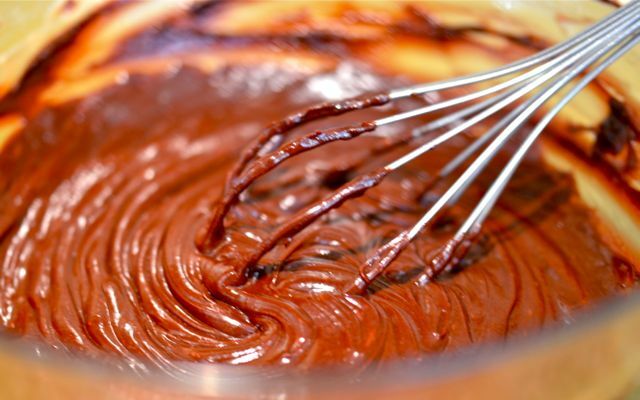 To make the ganache, melt the chocolate, heavy cream and coffee in the top of a double boiler over lightly simmering water. Stir occasionally, until the mixture is smooth, glossy and warm. 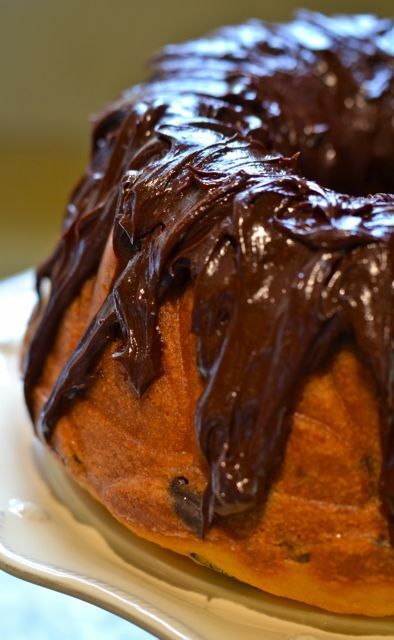 Drizzle the ganache over the cake. Serve. 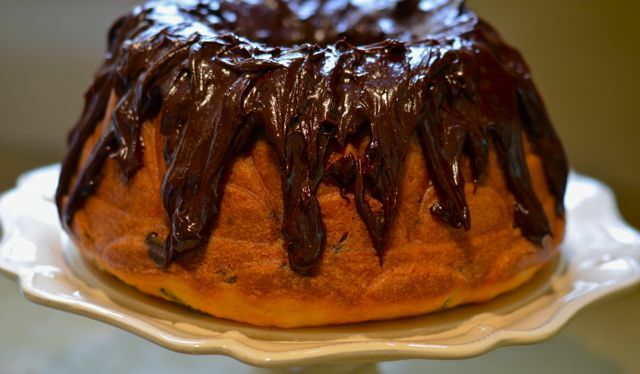 This sounds absolutely heavenly…I love fresh oranges, and you really can’t go wrong with any cake by adding chocolate chips and sweet ganache. I’m dying to make this, but alas, I’m on my own resolution to cut out sweets for a couple of weeks. Once I decide it’s time for an indulgence, I think this will probably be the first thing I whip up. Thanks for posting! Love, love this cake recipe! What lovely flavors all mingled together. Refreshing for such a dismal part of the year. Happy 2013! Talk about a divine cake – this … and combination of orange and chocolate. Has to go on file. … I like it with dark chocolate – this a rainy day project. This looks absolutely delicious. Who needs new year’s resolutions when you can have cake? Exactly! And thanks for the visit! Miss you guys! Wish you were still here! Breaking resolutions… I wouldn’t support any other decision from a food blogger. I didn’t get a chocolate orange in my stocking this year, so I may need to make this to get my fix. Thanks for sharing! Fabulous!! Orange and chocolate together is SO good! It is a great flavor combination and the citrus really is coming in now…you may see more of these flavors for the next few months! You are a wise man, and with all the awesome restaurants you go to, it would be hard to keep any resolutions! Happy New Year! And you gotta give cred to the guys who give the Mrs. Mama a big bag of chocolate chips for Christmas! Now THAT’S a good gift! We know what makes Mom tick…. That looks great! I always associate citrus fruits with the holidays. Must be all those pomanders. Or those boxes of clementines from Spain! We will take a box of clementines! Do let me join you in breaking other people’s resolutions! Haha. The cake looks awesome, especially with the chocolate ganache, yum! Aaaaahhh…this looks DIVINE! Drat…I am trying to lose my last few vanity lbs and am trying (“trying” being the operative word) to cut down on sugar. This is not good for my resolution, but these pictures look seriously scrumptuous!! Orange and chocolate…such a wonderful pairing! It looks delish! Thanks! It didn’t last long!